SMBs are taking to mobile solutions like ducks take to water, as revealed in SMB Group’s 2013 SMB Mobile Solutions Study, and as I discussed in 2013 SMB Mobile Attitudes and Challenges. In fact, I’m hard-pressed to think of any other technology area that has enjoyed such a meteoric rise. In reviewing the results, one of the things that really popped out is that even very small businesses (VSBs, with 1 to 19 employees) are adopting mobile solutions at a fast and furious clip. Consider that overall, 91% of all SMBs use mobile devices and services in their businesses, compared to 89% of all VSBs. Meanwhile, 67% of all SMBs agree or strongly agree that “mobile solutions are now critical for our business,” compared with 50% of all VSBs. 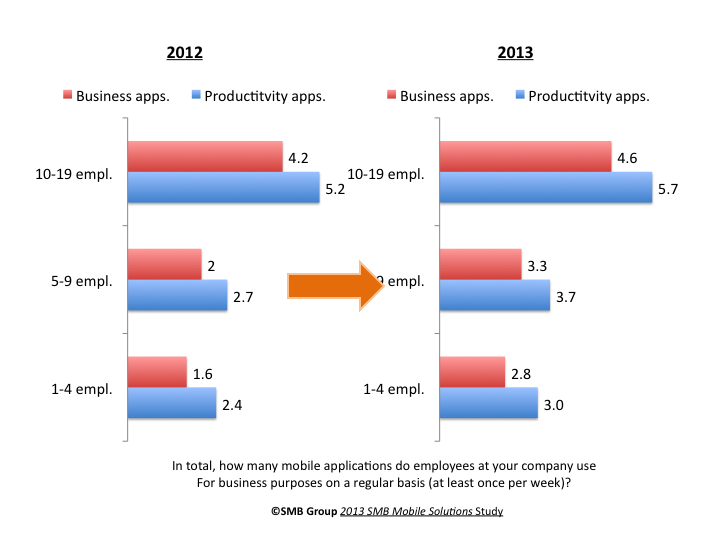 As shown on Figure 1, VSB adoption of employee, or internal, mobile apps has grown significantly since 2012. One of the areas that we’ve seen the biggest jump is in mobile payments, which is up from 18.5% in 2012 to 23% in 2013, as shown on Figure 2. More VSBs are outfitting their employees to accept mobile payments with solutions including Intuit GoPayment, Square, PayPal Here and Sage Mobile Payments. These VSBs see mobile payments as a key means to helping them meet their top business goals–growing revenues, attracting new customers, and improving cash flow. For instance, customers that are short on cash can buy–or buy more–from vendors at farmers or fleas markets who are armed with mobile payments devices. Plus, they’re so simple even kids can use them. Case in point is that 32 Girl Scout Councils are using Sage Mobile Payments as an option for cookie sales. Mobile payments can also help cash flow, helping to avoid bounced checks. And, with PayPal Here, vendors get paid instantaneously. We also found that many VSBs are not only using mobile payments devices while they’re out of the office or store, but also when they’re in it. The For instance, I spoke with one woman who runs a yoga studio who processes all of her customer payments through Intuit GoPayment on her iPhone. She doesn’t need to invest in a point-of-sale system, and payments are automatically integrated back to her QuickBooks system, saving time and helping her reduce the errors that come with entering data twice. Of course, the bottom line is revenues, and mobile payments solutions have proved out. Our research shows that VSBs that accept mobile payments are a whopping 87% more likely to expect their revenues to grow over the next year. 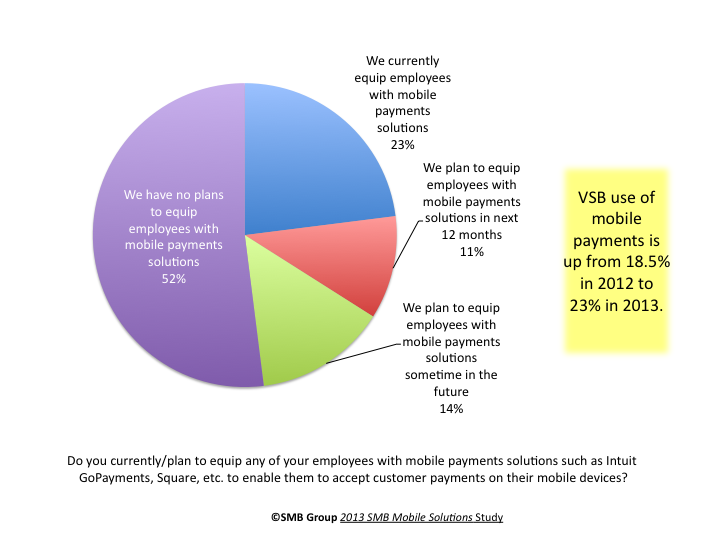 So, if you’re among the 52% of VSBs with no plans to use mobile payments solutions–think again! Mobile payments solutions can be a great and easy way to help you move your business forward. Previous Previous post: Is Big Data Relevant for SMBs?